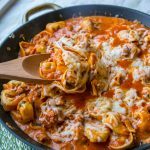 Sausage Tortellini Skillet – Your favorite tortellini comes together in a quick and easy hearty one pan meal the whole family will love! I was up at 4:30 am this morning to catch a flight to Chicago. As excited as I am to get to hang out with other bloggers, meet new friends and learn a ton, I do not enjoy the early wake up call. The good part…I didn’t have to drive to the airport. Thankfully, Sandra from A Dash of Sanity lives near me and is going to the same conference. So she drove! I really don’t mind driving, but at 5:00 in the morning, there are other things I would rather do. So I am off to a weekend of learning, and the boys in my life are home. I have to miss my son’s first basketball game of the season, but hopefully they will do well and I can hear all about it later. 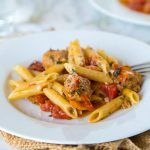 You know I am all about quick and easy dinners. 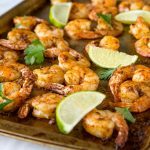 I love a one pan meal and so does my family. But I want to make sure they are always full of flavor. One thing I have found recently is Gourmet Garden herbs. They are fresh herbs that are packed in a tube for you. So all you have to do is squeeze out how much you need and put it back in the fridge. I don’t know about you, but I am always buying bunches of fresh herbs, and then end up throwing over half of them away a few days later. 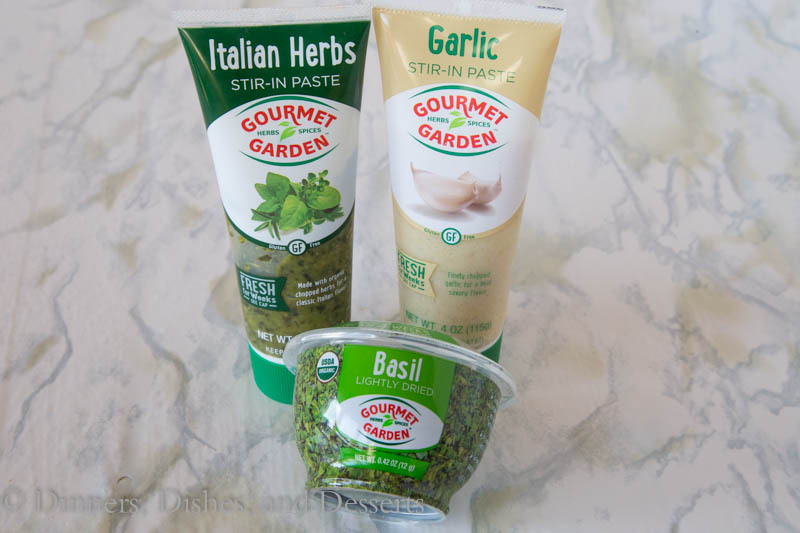 The thing I really like about Gourmet Garden herbs is they last for weeks in your fridge. So I always have them when I need them, and I am wasting a lot less food! 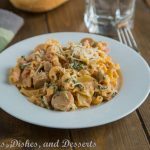 For dinners like this Sausage Tortellini Skillet it really adds the depth of flavor fresh herbs does, but you don’t have to buy multiple different fresh herbs to get it! 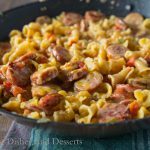 Sausage Tortellini Skillet is ready in no time. And even your pickiest eater is going to love it! My son had a friend spend the night a few weeks ago. This friend is one of the pickiest kids I know! So I was really not sure what to feed him. 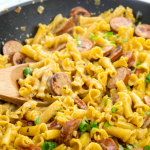 I figured, pasta, cheese, and sausage….what is not to like. He loved it. He even went back for 2nds. So if I can impress him, you know you can impress your family. 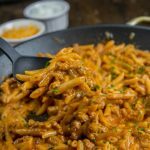 Everything cooks in one skillet, so clean up is super quick. And the leftovers are great the next day for lunch! And with how crazy things are this time of year, I think we can all be thankful for quick dinner and easy clean up! 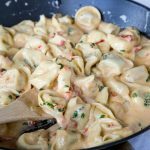 I used this large skillet to make this tortellini in, and it cleans up so nicely! 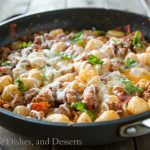 Sausage Tortellini Skillet - Your favorite tortellini comes together in a quick and easy one pan meal the whole family will love! In a large skillet brown sausage and onion together until cooked through. Stir in garlic and Italian seasoning. Cook for 2 minutes. Add marinara sauce and tortellini. 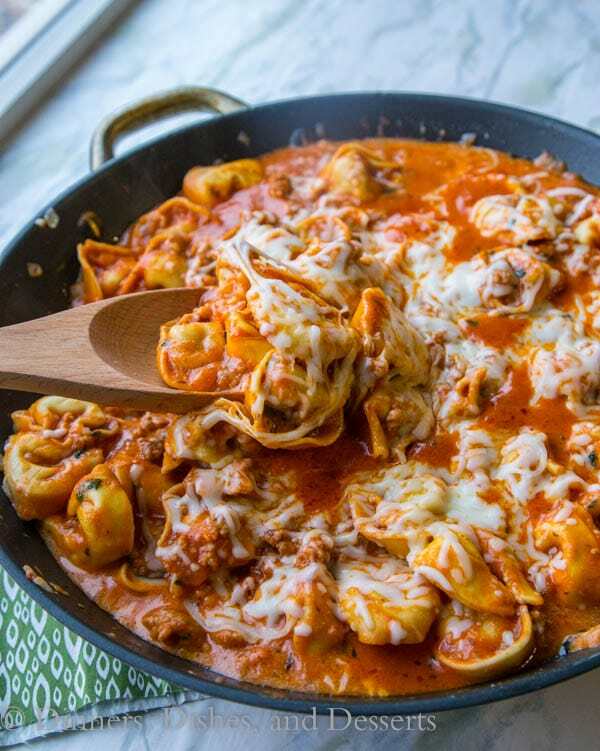 Cover and simmer for 10-15 minutes until tortellini are mostly cooked. Stir in half and half. Sprinkle with Mozzarella cheese. Cover to melt the cheese. Sprinkle with basil to serve. 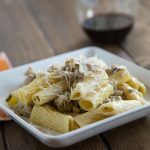 **I was compensated by Gourmet Garden to create this recipe. I have an ongoing relationship with them. All thoughts and opinions are 100% my own. Thank you for supporting the brands I love and that make Dinners, Dishes, and Desserts possible. Love this and love those Gourmet Garden squeeze tubes. Such a lifesaver! This super picky eater approves. 😀 This looks delicious! I’ll have to look for those pastes. They sound like such a time saver! This is my kind of dinner. 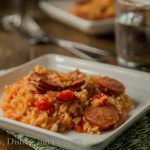 So much flavor plus it’s hearty and delicious! I’ve seen the Gourmet Garden herbs and have been intrigued, but I haven’t tired them yet. Going to pick some up next time I’m at the store! 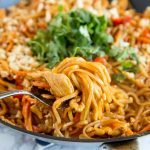 My kids would dive right into that skillet, and I love how Gourmet Garden makes it so easy for mom! Look at all that cheese!! 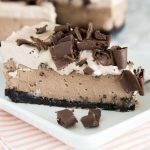 If I made this, I don’t have to share with anyone, right?! Ahhhh! I use Gourmet Garden products ALL the time. This is mostly because I hate chopping. 😉 This skillet looks fantastic! I had to leave at 3am Friday to get to Chicago. I was a ZOMBIE!! Never again! haha! I love this dish! Nothing beats jet lag like a good pasta dish!! This looks and sounds heavenly and I love Gourmet Garden herbs! It was so great to meet you this past weekend!! And this skillet? My family would go crazy for it! All of our favorite flavors! Do you know if the Gourmet Gardens products are available in San Diego, Ca? I have not seen them. I looked on their website and saw that they are located in Australia, it didn’t say where to buy them here. They are available at almost every major grocery store in the US. On their site, look at the store locator. you can put in your cite or zip code and it will give you a list. They are located in the product department, near the other herbs at my stores. 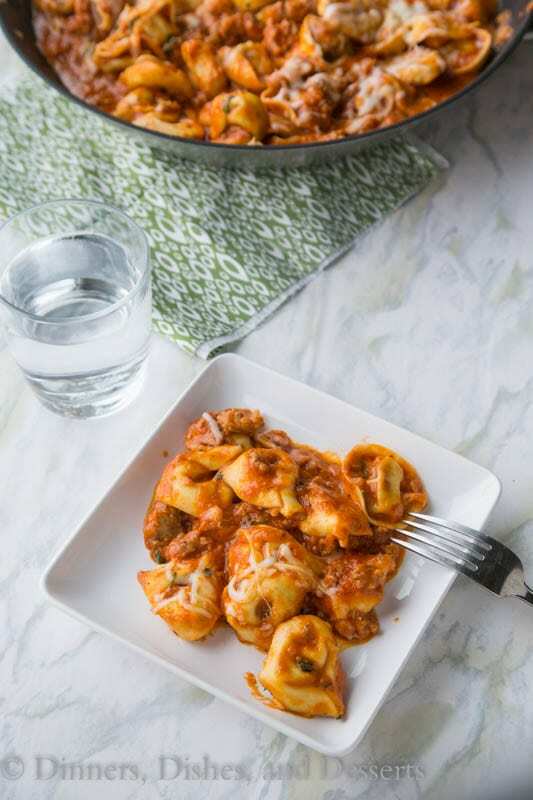 You could use those tortellini in any recipe that sounds good to you – just leave out the meat called for in the recipe. 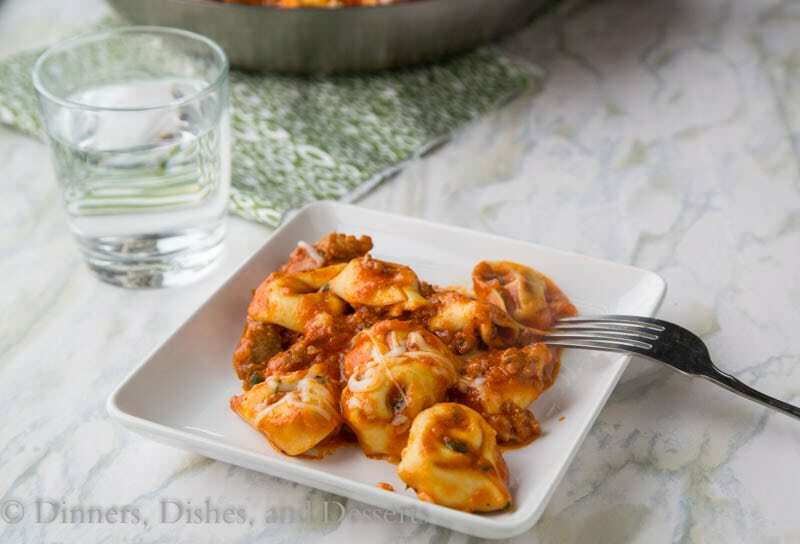 If there isn’t any meat, but you think sausage sounds good with it, then use your tortellini. 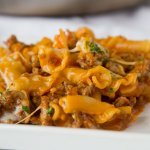 This soup would be good https://dinnersdishesanddesserts.com/italian-tortellini-soup/ or this other creamy tortellini recipe – https://dinnersdishesanddesserts.com/tomato-basil-tortellini/ My family loves sausage, so I will often use the sausage tortellini in recipes that call for cheese. 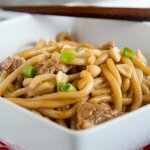 I just don’t add extra meat, because then it is too much. Hope that helps. 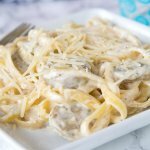 This is right up my taste love sausage and of course pasta, I would love to post this image on my blog with your permission and link it back to your recipe page so my visitors can get the recipe from your site, I will NOT post it cause its yours and you deserve the credit as well as the traffic, I am gathering only good images that help my blog and improve my appearance , you have very good images I would never do anything with out your permission.